The TV Input Framework (TIF) on Android TV makes it easy for third-party app developers to create their own TV channels with any type of linear media. It introduces a new way for apps to engage with users with a high-quality channel surfing experience, and it gives users a single interface to browse and watch all of their channels. To help developers get started with building TV channels, we have created the TV Input Framework Companion Library, which includes a number of helper methods and classes to make the development process as easy as possible. This library provides standard classes to set up a background task that updates the program guide and an interface that helps integrate your media player with the playback controller, as well as supports the new TV Recording APIs that are available in Android Nougat. 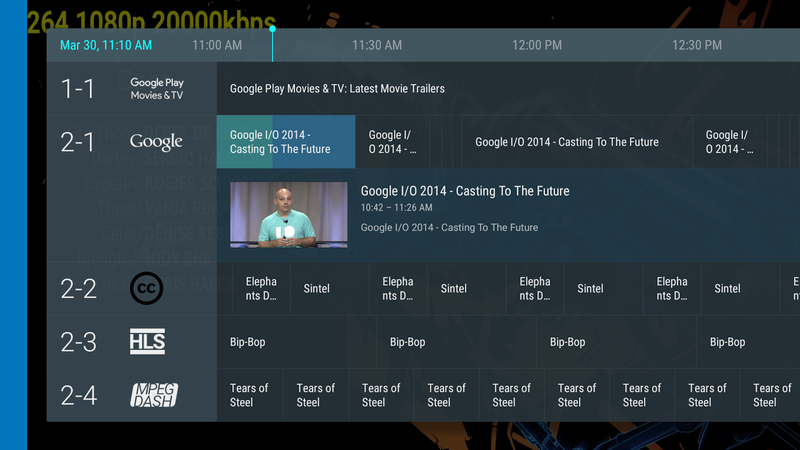 It includes everything you need to start showing your content on your Android TV's live TV app. To get started, take a look at the sample app and documentation. The sample demonstrates how to extend this library to create custom channels and manage video playback. Developers can immediately get started with the sample app by updating the XMLTV file with their own content or dynamically creating channels in the SampleJobService. Android TV continues to grow, and whether your app has on-demand or live media, TIF is a great way to keep users engaged with your content. One partner for example, Haystack TV, recently integrated TIF into their app and it now accounts for 16% of watch time for new users on Android TV. Check out our TV developer site to learn more about Android TV, and join our developer community on Google+ at g.co/androidtvdev to discuss this library and other topics with TV developers.